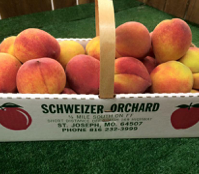 Purchased in 1988, this portion of Schweizer Orchards consists of 86 acres. It has U-Pick blueberries, raspberries, blackberries, peaches, apples and pumpkins. Vast varieties of vegetables are grown on this property. Inside our market we carry a wide variety of jams, jellies, salsas, relishes, and more along with our garden produce and fruits that are in season. We try to keep an assortment of kitchen items that you might need for the upcoming seasons. 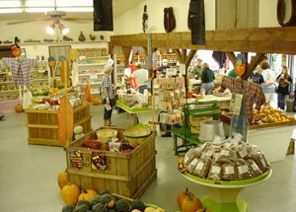 Check out the corn cob knobs, corn butterers, apple corers, cookbooks, and much much more. 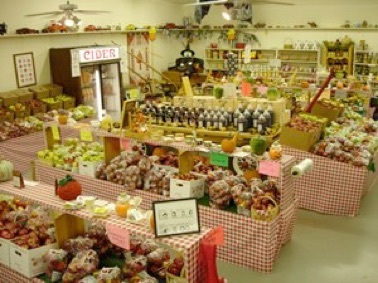 A variety of flavored ciders are available for your choosing also. Of course don't forget an apple or cherry cider slush to help cool off on those hot days. Enjoy your family outing in our playground area, where you can sit and relax on one of many picnic tables while the kids run and play. Mix and place in 8 inch cake pan. Cut together and sprinkle on top. Sprinkle on top of crumbly mixture. Bake at 350 degrees for about 40 minutes. Serve with ice cream.